The first triumphal David vs. Goliath story of 2016, Carew thought his compact book was the perfect size and weight to attempt the record. The first triumphal David vs. Goliath story of 2016, Carew thought his compact book was the perfect size and weight to attempt the record. Carew’s unique first-ever events include book signings on top of volcanoes, whistle-stop tours by train, digital book signings on horseback, “pop-up” book signings, and now the first author and publisher in history to deliver a book by drone. According to the Consumer Electronics Association, 700,000 drones were expected to ship in the United States in 2015, and that number will only increase in 2016. The FAA has just released new rules governing the use of drones and companies, such as Amazon, FedEx, and author Carew Papritz, are scrambling to deliver books and products in this new and innovative way! 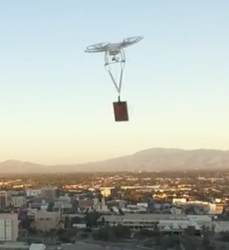 With his unusual background of both having worked as a cowboy and as a Hollywood filmmaker, Carew created an original, humorous, and high energy video to showcase the drone delivery. Carew Papritz, also known as "The Cowboy Philosopher," is the author of the multi-award winning book “The Legacy Letters.” This best-selling author left his career as a filmmaker in Hollywood, and returning to his ranching roots, worked as a cowboy on a cattle ranch in the Southwest where he began writing his book. “The Legacy Letters,” though fictional, has also won acclaim as a life lessons book for all generations, gaining the distinction of being the only book in publishing history to win awards in both fiction and non-fiction categories. A Renaissance Man in an age that lauds the specialist, The Huffington Post says Papritz "intrigues and enlightens, charms and catalyzes change for every reader."